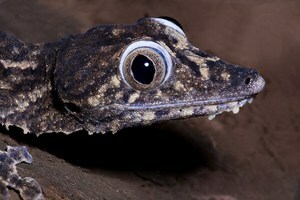 Giant Leaf-tailed Geckos are native to eastern Madagascar and live in dense tropical rainforests. They are nocturnal, which means most active at night (this is when they hunt for food: invertebrates and neonatal mice). During the day, they rest on trees. While resting, they sleep with their heads flattened against the trunk and adjust their body to the surroundings. They have broad, flat leaf-like tails which extends between the hind legs, and they are usually brown or green to camouflage with trees. Although not much is known about its reproductive behaviors, females lay two to three eggs at a time, up to three times a year. These eggs can take over three months to hatch on the forest floor. Geckos are collected for the pet trade but are not endangered (listed at least concern). 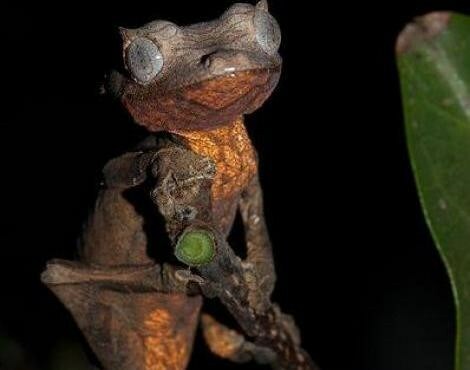 They are also affected by deforestation and logging because they use the cover of branches and leaf litter to hide from normal predators like snakes. Deforestation and slash-and-burn clearing tactics are detrimental to the survival of all Madagascarian geckos. The forests have been reduced to only 16 percent when it originally covered the entire island. 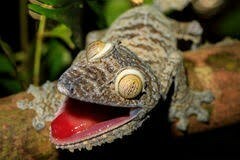 The gecko population is declining. 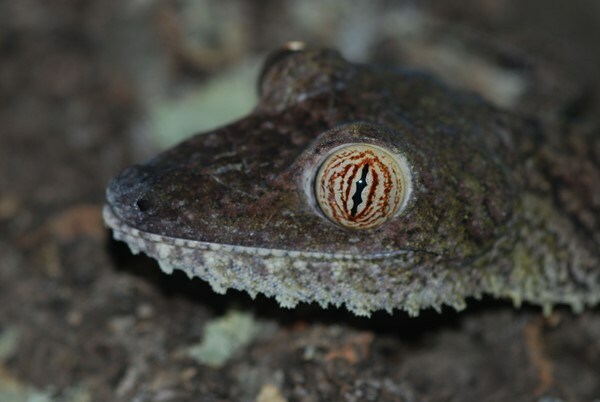 The Giant Leaf-tailed Gecko at WEEC is shy and likes to sleep but is a stealthy hunter. He eats mainly vitamin dusted crickets and has no trouble catching them. He also enjoys water from a bowl and the leaves in his enclosure, which are misted. “Giant Leaf-Tailed Gecko (Uroplatus Fimbriatus).” INaturalist.org, California Academy of Sciences, www.inaturalist.org/taxa/33526-Uroplatus-fimbriatus. “Giant Leaf-Tailed Gecko.” Smithsonian's National Zoo, 29 Aug. 2017, nationalzoo.si.edu/animals/giant-leaf-tailed-gecko. “Uroplatus Geckos of Madagascar —.” Uroplatus Geckos of Madagascar, www.wildmadagascar.org/wildlife/uroplatus.html. 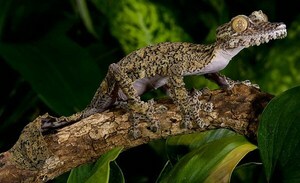 “Leaf-Tailed Gecko.” A-Z Animals - Animal Facts, Pictures and Resources, a-z-animals.com/animals/leaf-tailed-gecko/. “Giant Leaf-Tailed Gecko Care Sheet.” Reptiles Magazine, Pet360 Media, www.reptilesmagazine.com/Care-Sheets/Giant-Leaf-Tailed-Gecko/.